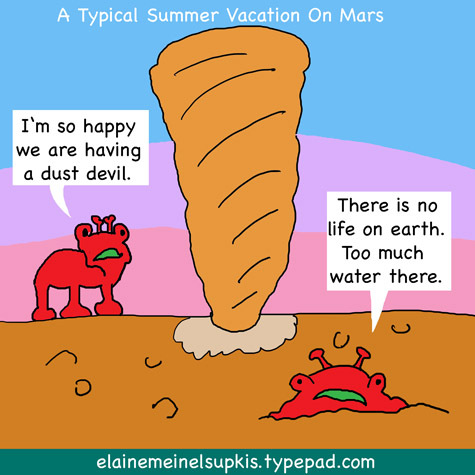 Scientists now say there is no life on Mars because dust devils scour the landscape and this causes a side effect of hydrogenperoxide to form and act like an antidisinfectant on any organisms in the soil. I wonder if this happened on earth during the Great Extinctions of the Permian and other, lesser extermination events. Mars can't have life due to production of disinfectants that have cleared out all organic molecules. So much hydrogen peroxide is formed, in fact, that it would fall to the ground as snow. This explains a conundrum dating back to 1976, when the first Mars landers, Viking 1 and Viking 2, failed to find any trace of organic matter in the Martian soil. Hydrogen peroxide is a potent oxidant and antiseptic that rapidly destroys living matter. The old Viking result was surprising, says the lead author of the second study, Sushil Atreya. APOD has some pretty pictures of Mars showing the water regions. Explanation: Looking for water on Mars, researchers using detectors on board the orbiting Mars Odyssey spacecraft have created this false-color global map of energetic neutrons from the otherwise Red Planet. What do neutrons have to do with water? As cosmic rays from interplanetary space penetrate the thin martian atmosphere and reach the surface they interact with elements in the upper layer of soil, scattering neutrons back into space. But if the martian soil contains hydrogen, it seriously absorbs energetic scattered neutrons. Tracking variations in absorption, neutron detectors can map changes in surface hydrogen content from orbit. Hydrogen content is taken as a surrogate measure of frozen water (H20), the most likely form of hydrogen close to the martian surface. This latest information paints an ugly picture, doesn't it? When a planet gets dry enough, it has dust storms that produce hydrogen peroxide, the stuff that makes blondes frizzy-haired, so no life can exist? Dovetailling this information with the fact that acid rain isn't so pleasant for most life forms, too, one has to rethink the idea we can just goof off and see what will happen next! The hurricane season this year isn't happening here even as Asia is pounded by powerful storms. I noticed this last year: we had terrible, powerful hurricanes but the midwest and southwest were so dry, even great hurricanes dried up instantly when they ran up into the dry zones. Back then, we were in a drought up here in the Northeast. This year, we are getting amazing amounts of rain without any hurricanes. The atmosphere has a limited amount of water it holds. So if it is raining hugely here and in China and India, it isn't raining in Florida, for example. The drought in the Amazon has an affect on all this. We don't understand, of course, the earth's systems are very complex, the most powerful computers humans have rigged up and give only a gloss on the reality of the complexity of our weather systems, forget our ecosystems! The study of the dead planet, Mars, is helpful as a warning for our earth, ditto Venus. We are like the Three Bears: we can't be too hot or too cold or too big or too small. We have to be just right. And this means we don't spill the porridge or break the chairs or pee in the bed. The most primitive life forms seem to enjoy the deteriorating chemical conditions of the seas. BBC: Thousands of holidaymakers in the Mediterranean have been stung by jellyfish as huge swarms of the creatures invade coastal waters. Some Spanish beaches have been closed, but Sicily and North Africa are also reported to be badly affected. The varioius algae blooms and this business with the jelly fishes all over the earth seems to be telling us, our oceans are reverting to a condition last seen about 550 million years ago. Great if one is a fungus or a single celled entity that likes sulfur. When the Permian great extinction happened, the planet must have looked like a cross of Mars and Venus only the vast oceans saved life forms from total extinction. And even the primitive primates managed to hang on in the form of early mammalian manifestations. We stuck to the sheltered rift zones and munched on whatever we could find. So did the early dinosaurs. When things got better, they beat us in the race to fill all ecological niches. We better discuss the future with the cockroaches who are more evolved than jellyfishes. Or maybe we should make an alliance with jellyfishes. The moron suggesting we 'cope' with pollution rather than stop it must be a jellyfish agent. Burnett advocates one side of that debate: Worry about the consequences, not about preventing what might happen, especially when we don't know the chances of it happening or how bad it would be. Take the example of malaria, Burnett told RAW STORY. Global warming will probably increase the range of malaria-carrying mosquitoes, but the Kyoto Protocol will not lower the temperature significantly. We could attempt to prevent global warming, or we could inoculate people and spray DDT. "One billion [dollars spent] can save a million lives," he said. "Where is the better investment?" The same applies for coastal flooding from rising sea levels. Why not just stop building along the coasts, he asked, or build walls to prevent the flooding, which would cost Americans less than enacting the Kyoto Protocol. "We spend an inordinate amount of money subsidizing people for poor planning decisions," he said. It would make more sense to evacuate the planet if we want to 'cope' with the mess we are creating. We could go to Mars! Yup! No jellyfishes there! It never ceases to suprise me, how dumb people are. Unable to stop doing stupid, destructive things, they suggest we conform with a bad system. Move into caves like the Morlocks, for example. Become cannibals. Or maybe just die off after poisoning everything. The iron rule of nature that invaders will flourish while the home team dies is, thanks to humans and global warming, at work like crazy these days. Environmentalists and fishermen in northern Norway are warning of a Russian invasion of alien crustaceans which are threatening to ruin the local sea fauna. They say the giant red king crab is spreading with alarming speed from Russian waters along the Norwegian coast, destroying everything in its wake. The crab has few natural enemies, and is considered to be an omnivore, digesting everything from cod larvae to other crabs. Humans have tipped the ecological apple cart and now we are seeing all sorts of unintended effects. The old story of bringing in a cat to catch the mouse than a dog to rid us of the cat (Fluff hates this part of the story, he says it is backwards) then bringing in a lion to rid us of the dog and then an elephant to get rid of the lion and then a mouse to get rid of the elephant only the house is now in ruins. Yes, this is how people think: one step at a time, off a cliff. Do you know the ditty about the old lady who swallowed a spider? I am puzzled by the hydrogen peroxide story, I thought there was no free oxygen on Mars, so what is oxidizing the water to Peroxide? There is a small amount of oxygen and water, I believe, and in the past, when the scouring was done, there was a lot more water and oxygen in the atmosphere, I am guessing. Yes but Pure H2O2 is very unstable, and with the lower pressure on Mars the decomposition rate will be faster, 90% peroxide is more unstable than 100%. But this all happened about 500 million years ago. At that time, our own climate was totally different, too.